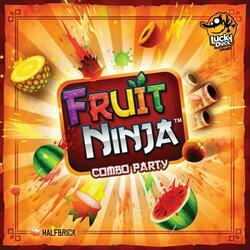 A game of draft, risk taking and speed from a famous application, here comes Fruit Ninja! Each player chooses a Fruit card from his hand. If two or more players unveil the same Fruit, the first one to grab the Katana Channel gets a Reward! Players then place their cards on their Combo column. Players must choose whether they want to continue to expand their current Combo, taking risks to try to win more points, or immediately turn it into points and start a new Combo. The bigger your Combo is, the more points it will earn you! Give your cards to your left neighbor and start a new round! Fruit Ninja: Combo Party was to be funded on the Crowdfunding Kickstarter (See the campaign) platform, but has been cancelled by its author. Contents of the box : 1 Katana Round, 30 Reward cards, 72 Fruit cards, 6 Game Help cards, 98 Golden Apple counters, 1 Rules Booklet.